I’ve been waiting for this game to hit KickStarter ever since I heard of it. To me, it sounds like the perfect marriage between the PC game Payday 2 and Netrunner. Using your wits to outsmart each other. Who will win, the bank or the dubious criminals. Read on to find out more about this latest game from Grublin Games. Look out for coverage of this game at the UK Games Expo on the 3rd-5th June. Put this date in your diary. The CCTV is installed. The laser tripwires are active. The alarms are set. The vault door is shut tight and your bank staff are armed. To others, it’s a security nightmare that’s nigh impossible to breach. To you, however, it’s the stage for the Perfect Crime. Grublin Games (Cornish Smuggler, Waggle Dance, Terralith) are launching an asymmetrical, modern day, tower defence style bank robbery game with fast setup, hidden information, tons of tension, and is based on real life and filmic heists: Perfect Crime. Perfect Crime is a game for 2-5 players, takes ~90 minutes to play and can be played in co-op, semi co-op or full competitive modes. Once the bank is ready, it’s up to the robbers to pick apart those carefully planned defences. Are you going use stealth? adopt a brute force approach or sabotage the bank from the inside? Do you have equipment to get past those cameras? What about the laser tripwires? Is tunnelling through the floor too risky? What if everything goes wrong, the alarms go off? Do you push your luck to get in the vault or bail! 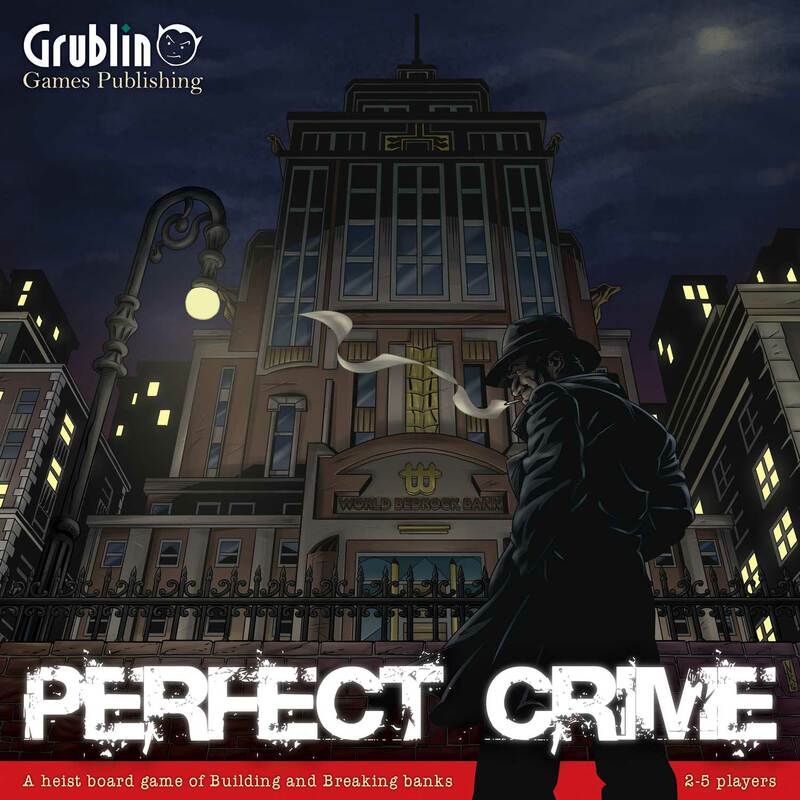 Henry Jasper, founder of Grublin Games and designer of Cornish Smuggler, has spent the last two years working on Perfect Crime, perfecting the game mechanics and ensuring that Perfect Crime is packed with as much tension, drama and story as it’s possible for a board game to have. Grublin Games prides itself on working with the best artists, our games not only play brilliantly but look beautiful too. Perfect Crime is no exception working with illustrator Nicholas Raimo and art director Ian Whitford. Grublin Games (Cornish Smuggler, Waggle Dance, Terralith) is an independent board game publisher based in (Cornwall), UK who have been publishing high quality, heavily thematic board games via Kickstarter since 2013. Grublin runs highly engaging campaigns that not only deliver bang on time, but make supporting on Kickstarter a truly inclusive experience. Posted in Event, Kickstarter, UK Games Expo and tagged Grublin Games, kickstarter, Perfect Crime. Bookmark the permalink.